Distributor: Currently licensed by GKids/Shout Factory. Notes: Based on a novel by Takeuchi Yoshikazu. About the age rating: The DVD release is unrated, so I'm basing the DVD rating on an estimate with the knowledge that the VHS version -- which was edited -- was rated R.
(from box cover) Pop singer Mima Kirigoe looks forward to a bright new career when she quits her chart-topping trio to become an actress. When she lands a role in a sexually charged murder mystery, Mima's life begins to fall apart. Reality and hallucinations merge into a terrifying netherworld where innocence is lost and dreams become nightmares. Quickly descending into a dangerous state of paranoid delusions, Mima discovers Internet sites describing every intimate detail of her life. Helpless and afraid, she watches as her associates are threatened and killed by a mysterious stalker. In the tradition of great suspense masters, director Satoshi Kon (Memories), special advisor Katsuhiro Otomo (Akira), and Madhouse Studios (Ninja Scroll) bring Yoshikazu Takeuchi's thrilling suspense novel to the screen in a tour de force that brings animation to a bold new level. 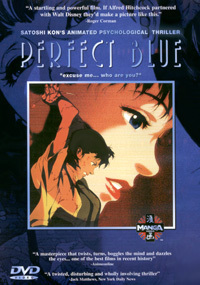 At Comic-Con a few years back, we spoke with representatives from Manga Entertainment, and among their promotions, one stood out - their impending theatrical release of this movie, Perfect Blue. We had first heard about it a while back, when it is was still in pre-production in Japan, and we looked forward to see it come to fruition on the screen. While we were unable to see the theatrical release of Perfect Blue as the closest theater that showed it was in Los Angeles (four hundred miles away), we finally got to see it (as an early Christmas present, no less). For one, do *not* watch this film with the lights off unless you're *really* masochistic. It is grade-A creepy, and about as disturbing as you can get without having to institutionalize yourself afterwards (though you may want to). Perfect Blue is the first truly suspenseful movie we've seen in a LONG time - it's far more like The Sixth Sense than The Blair Witch Project as far as edge-of-the-seat, keep-you-guessing-until-the-end thrills. And I don't think it would have been half as effective and genuinely scary had it been live-action - this is animation at its finest. For starters, the characters are all very fleshed-out, from the hordes of ultra-obsessive otaku (and we use this term in the strictest of meanings), all the people associated with the entertainment industry that flit around Mima left and right, and, of course, Mima herself, who grows from flighty, naive, and easily manipulated idol singer to a genuinely frightened young woman in the grip of madness as her world shifts from reality to horrible fantasy in the blink of an eye. You actually feel as if you are going mad along with her as this movie gives you so many twists and turns that you don't really know who is who, or what is real - and yet it's incredibly realistic all the same, which makes Perfect Blue all the more frightening. What adds to this movie is the eerie parallels between Kirigoe Mima and Selena, the Latina idol singer who was murdered just as she was crossing over to success in America ... you'd think Takeuchi drew inspiration from real life, the way this is plotted. As for the ending - well, we're not going to give it away for you, as it would totally spoil the fun of this movie! ^_^ It starts out as if you've seen it all before, but there are more than enough twists and turns that, the moment you think you've figured it all out, everything's changed. Refreshing, and exceptionally well-done. Finally, the technical notes. What else would you expect but the best from Madhouse Studios? This is one of the most realistic animations yet, with even background characters moving fluidly and realistically, without loss of detail, as we've seen happen in many other titles (from El Hazard to Phantom Quest Corps). The music was perfect, even in the English version, from CHAM's nonsensically fluffy, yet catchy tunes that could easily be right in the charts with Speed and any other real-life idol groups in Japan, to the background music, which was very effective without being glaring. The acting itself was sophisticated, subtle, and well-done, with an exceptional scripting job. And, yes, this is the dub - which is right on the same level as Shinesman and Princess Mononoke in quality. ZRO Limit deserves a commendation for this. Simply put, Perfect Blue is everything Kite should have been. But where the latter was a hyped-up gore-fest with an inane plot and unsympathetic characters, Perfect Blue is a crackingly paced movie that is mature, exciting, and thoroughly chilling in its execution. Yes, there's blood here, but the truly frightening aspect of the murders that go on is not seeing the murder graphically played out - but who's doing it, and why. The movie really plays with your mind - and challenges it. This is no time to turn off your brain and watch the blood splatter - if that's what you're expecting, you will be sorely disappointed. However, if you're a fan of a good movie (and not just a good anime), and don't mind getting the pants scared off you in the process, Perfect Blue is the perfect ticket.